Firefly luciferase is widely used as a reporter for studying gene regulation and function, and for pharmaceutical screening. Biotium’s Steady-Luc™ HTS assay system is a homogeneous firefly luciferase reporter gene assay kit with a half-life of about 3 hours for the quantification of firefly luciferase expression in mammalian cells, allowing batch processing in microplates. Firefly luciferase is widely used as a reporter for studying gene regulation and function, and for pharmaceutical screening. It is a very sensitive genetic reporter due to the lack of endogenous activity in mammalian cells or tissues. However, the light production resulting from the reaction leads to formation of suicidal adenyl-oxyluciferin at the enzyme surface. It results in very short half-life of the light emission with a flash-type kinetics. Because of this, flash-type luminescence must be detected immediately after initiating the reaction, which is not compatible with batch analysis of samples. Biotium’s Steady-Luc™ HTS assay system is a proprietary mixture of substances that modify the enzymatic reaction to produce a long lasting signal (steady glow) by preventing the formation of adenyl-oxyluciferin at the enzyme surface. It is a homogeneous high sensitivity firefly luciferase reporter gene assay kit with a half-life of about 3 hours for the quantification of firefly luciferase expression in mammalian cells, allowing batch processing in microplates. Glow-type luciferase assays like Steady-Luc™ have lower luminescence signal compared to flash-type assays. The sensitivity and limit of detection of the assay will depend on luciferase expression levels in your experimental system as well as luminometer sensitivity. 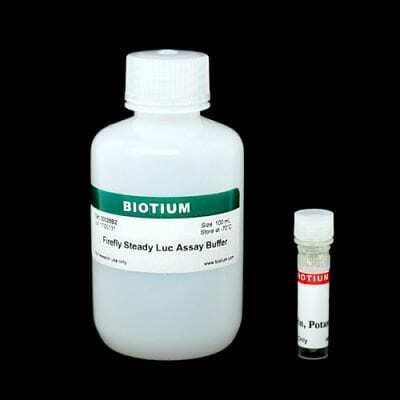 Biotium also offers Steady-Luc™ Firefly HTS Assay Kit (Lyophilized) (catalog no. 30028L), a new packaging format that includes lyophilized assay buffer for convenient room temperature shipping and storage at -20°C. Simple: single step homogeneous assay. Glow kinetics: luminescence half life of about 3 hours. Economic: save up to 45% compared to other brands. The Firefly Luciferase Assay Kit is designed for detection and quantification of firefly luciferase reporter enzyme from cultured cells in a simple, efficient and linear fashion.